Description: This theme neatly compiles the great features given to us by SubBlack and ProSilver. Thus the name ProBlack was conceived. I have done a complete re-work of most of the images and icons. They are now of greater quality using newer graphic technologies from both PhotoShop and FireWorks. Goldsboro Web Development has taken over the project from and by permission of leewells (as in, Michael Lee Wells, as in the owner of Goldsboro Web Development) to keep it free for the community. Last edited by leewells2000 on Mon Mar 24, 2014 8:51 am, edited 1 time in total. Looks good, and very nice to see you getting the rights Congrats! Just an update, we currently have a proBlack theme in the works that will be 100% HTML5, respinsive, with Retina icons and the option (you have to pay for it) for a Revolution Slider. We are about 4 months from release but it is looking to be a show stopper. I have never seen this topic until today because of your reply in it. Last edited by Neo on Tue Mar 25, 2014 5:57 pm, edited 4 times in total. 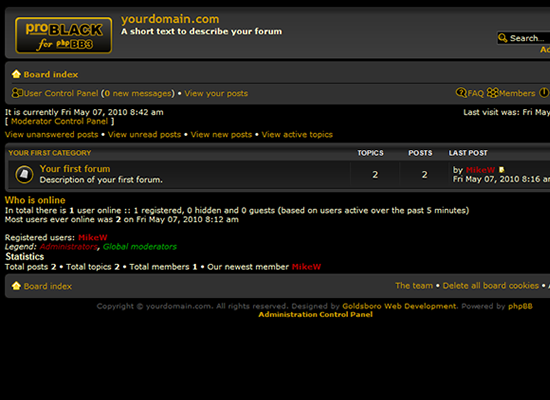 Nor google nor various phpbb boards or the creator's website were of any help.